Azhar is a film which looks good in snippets but when all those pieces are stitched together, it looks disorganized and confusing. It is like reading a book where a naughty boy has arranged all the pages in a random order. Mohd Azharuddin was a popular name in Indian cricket, which became further infamous after his match fixing controversy. Controversies are like popcorn, the more the merrier and Bollywood loves popcorn :) That is the reason, no one bothered to make a movie on Sunil Gavaskar and Kapil Dev. 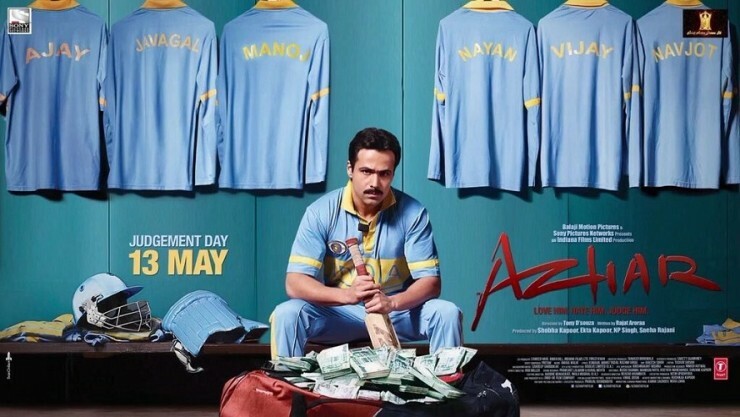 Rajat Aroraa wrote this film from Azhar's perspective in which Azhar is shown as the hero of nation. A patriot who always thought of his country, his team before self. The beauty about perspective is that everyone has it. For that matter, even Raavan had his own perspective! I don't want to take sides and discuss whether Azhar was guilty or not. You can watch the movie and decide whose perspective who believe more. Emraan Hashmi is the only good thing in the film worth watching. You'll love his swagger (which he did even better than real Azhar), his machismo, flamboyance and his one liners. I loved this one - When Javed Miandad tells him that Pakistan will win because today is Jumma, Azhar responds "Lagta hai aap bhool gaye bade bhai, mere to naam main hi Mohammad hai". Whistle Whistle! 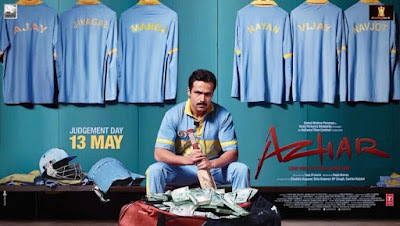 Emraan has done everything that'll make you love him just that he doesn't look like Mohd Azharuddin. Those who love cricket will tell you that Azhar used to speak very fast almost mumbling his words. Who can forget his pet line "Well the boys played well"
Prachi Desai doesn't have much screen presence and I was disappointed to see her in a non-glamorous avatar. One can't expect any acting from Nargis Fakhri. One top it, she had to shed copious tears in the film which was difficult than a Mt Everest expedition for her. In all the emotional scenes, you'll get confused whether she is sad or suffering from common cold blowing her nose in tissues! Better read your script next time Nargis and stay away from those emotional roles. Lara Dutta sports a poker face in the film. Perhaps no one told her that "being stern" and "being emotionless" aren't synonyms. Rajesh Sharma plays role of bookie M.K. Sharma with great conviction. For a great actor like him, this role was a cake walk. Kulbhushan Kharbanda plays the role of Azhar's Nanujaan who inspires him to become the great cricketer. It is a very strong character full of emotions and successfully draws audience empathy towards Azhar. It is a totally made up fictional character and one of the favorite Bollywood masala tricks. Remember Milkha Singh's Grandpa's voice haunting him in Bhaag Milkha Bhaag as a cover up for him losing the race. Total filmy! A big round of applause for Kunaal Roy Kapur for finally doing something which can remotely qualify as an acting. He has set such a low benchmark for himself that even a 1% effort from him looks so great. Bravo! All other cricketers looks artificial. Especially, when we all know how Manoj Prabhakar, Ravi Shastri, Kapil Dev, Siddhu Paaji and Ajay Jadeja actually looks like and speak. It is difficult to create them onscreen once again with someone else.